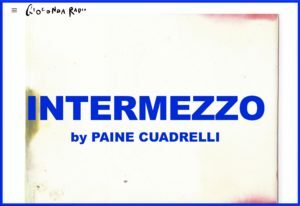 INTERMEZZO is a monthly broadcast that gives voice to a great crew of Italian visual artists of the 20th century. Sometimes, during a sort of digital ritual, in a limited space and time, and just, on Gioconda Radio, the selected artists reveal themselves through music to the ones who listen, giving some food for thoughts about art, life as art, art as life, private obsessions and funny stories, which have never been heard before.The programme aims to actualize a recent fertile and memorable Italian art past and to talk about art through music with old and recent sounds. Because art, as music, is an endless story. This sound project is curated by Paine Cuadrelli and Cecilia Dossan, in collaboration with Federica Panelli and in dialogue with artists’ archives and foundations.